What does it take to get me out of bed at the abominable hour of 4 AM? Comet Lulin, that's what! I've been hearing some good reports about it, and saw a fantastic photo of it by Karzaman Ahmad at Spaceweather.com. According to Tony Cook (Tonk) at CloudyNights, the comet's orbital plane is closely aligned with ours and will result in a rather prolonged period of interesting tail geometry. The result is a potentially long-lived anti-tail appearance as the ion tail and dust tail fan out from either side of the comet. It was my hope that I would be able to see this fascinating display this morning before the full and waning moon overpowers it for the next couple weeks. I arrived at Sunset Crater National Monument shortly after 5 am with the moon blazing away and lighting up the snow-covered landscape. The head of Scorpius was rising, and Antares was flickering with a rusty light just over the tops of the cinder cones. While the sky was still bright with moonlight, I shot a few photos of the landscape, and then set up my 8 inch Dobsonian. The comet was a snap to find and readily pierced the moon-washed star field as a round glow with a nicely condensed core. I'd estimate the degree of condensation as 6. Initially, I saw probably about 2 arc minutes of the core region. The bright 6th magnitude star, 47 Librae anchored the east side of the field. As the moonlight began to dwindle and the comet rose higher in the sky, more structure began to appear. Compared to the neutral gray background, the comet emitted a very slight aqua tint. A definite brightening proceeded eastward away from it at a PA of about 100 degrees. This extension (dust tail) was visible out to about 9 arc minutes from the core. As conditions improved, the coma also appeared to blossom a bit more to a diameter of about 6 arc minutes. At this point, the brighter core took on a more elliptical shape that preferred to drag off to the east. 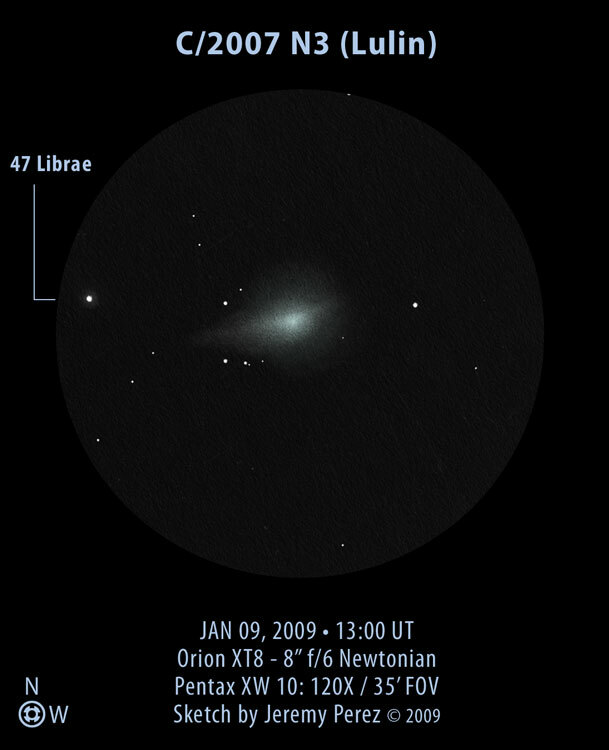 On the west side of the comet, a much fainter extension (ion tail) emerged from the coma at a PA of about 290 degrees. A quick look at 240X showed the coma to be brighter along its southern half, perhaps due to the dust tail fanning widely behind and to the south of the comet. I didn't spend time trying to compare the comet's brightness to nearby stars, but it was definitely brighter than 8th magnitude M107--I'd estimate by at least 1.5 if not 2 magnitudes. That's a very rough estimate, so don't rely on it for anything. But if correct, that would put it around 6th magnitude, at the threshold of naked-eye visibility under a dark, transparent sky. I did not try to spot it naked eye, however. The extended details I observed were very subtle and required much time spent observing with averted vision. Scope tapping, sweeping, and moving the core outside of the field of view on different sides, all helped to bring these structures into view. With strong moonlight, light pollution, or murky skies, they are likely to be invisible while the comet is so low. The central core however is quite bright and should be visible to some degree under poorer conditions. The time between moonset and the beginning of morning twilight was fleeting, and the gradually improving view halted, and began to quickly deteriorate. I spent probably 15 minutes plotting the star field, then a half hour examining the comet for structure, and a final 15 minutes trying to eke out the last, faintest bits of detail. It was an hour very well spent. I attempted to track down the pairing of comet C/2008 X4 (Christensen) and M107 but was only successful in spotting M107. I wasn't able to spend much time on that side trip, since I needed every bit of attention for Lulin, and I'm glad I made that choice. Hopefully, Lulin will be quite a bit brighter in two weeks when the new moon cycle returns and this comet's beautiful features will be easier to detect, and rich with developing structure. Thanks for the great report and sketch! I haven't had the pleasure to see this comet from a dark site since my first sighting of it 12-28-09. It's too bad the moon will be interfering for a while, I can't wait to see what this will look like in the next few weeks. Also have to say I'm a big admirer of your sketches and observations, please keep up the good work. Thanks for the post in amastro. We have been clouded in here in the midwest (snowed in too). But we are leaving for the carabbean tomorrow and your sketch will help me find the comet from aboard ship. Aaron and Jule, thanks for your comments. you've put together. I hope you're able to enjoy more views of it in a couple weeks. Jule I hope you have an enjoyable trip. It can be pretty hard to find a reasonably dark spot on a cruise ship--they're lit up like the surface of the sun! :) I hope you manage to spot it. Let me know how it goes. CAN WE CALL IT A NIBIRU ? CHANGE OF EARTH POLE SEEMS TO BE VERY HIGH ? Even in the 21st century, news of incoming visible comets is often greeted with both excitement and anxiety. We are used to the moon, sun, planets and familiar constellations. But visits from these dusty, gassy, eerily blue-green transients are unusual enough to cause an interesting degree of speculation. I am by no means a comet expert; however, I have had the pleasure to observe a number of them with my own eyes. Some of them pass close to Earth and put on spectacular displays, such as comet Hyakutake (C/1996 B2) in 1997. The vast majority are much more subtle. It is helpful to note that at any given time, there are dozens of comets swinging through the solar system, and new ones are discovered all the time. In the last 300 years, 15 different comets have passed within 15.3 million km of Earth (which could be considered relatively 'close'). In 2006, the beautiful comet 73P/Schwassmann-Wachmann passed within 11.8 million km. By way of contrast, comet Lulin (C/2007 N3) will pass Earth at a distance of about 64.3 million km -- that's more than 4 times the distance of these other comets. Measurement of its orbit also shows this to be its first passage into the inner solar system. I've seen no astronomical evidence for Sitchin's proposed, planet Nibiru, but if for a moment we were to consider that such a populated planet actually did exist, I doubt its gravity would be so uninhabitably low that it would be voluminously outgassing as this and other typical comet do. Such a body would also be much brighter at its current distance. Sitchin also proposes that 'Nibiru' would have an orbital period of 3,750 years--comet Lulin does not possess such an elliptical orbit. Although comets have certainly been the cause of catastrophe in the distant past when colliding with Earth, they are still fascinating objects to observe and follow through the sky. If you have a pair of binoculars, I encourage you to take a trip to darker skies (if you live in an urban area) and take a look at the unique passage of comet Lulin late in February. Downloadable finder charts can be found here: Sky and Telescope: Catch Winter's Comet Lulin. You can also find a wealth of continuously updated information on current and newly discovered comets here: Aerith.net. You may also want to perform a Google Search for "Near Earth Object Surveys" to have a look at discussions about current and proposed science programs to detect potential earth-impacting bodies such as asteroids and comets that could cause great devastation if such collisions occurred. Rebecca, thank you. I'm happy that you enjoyed images. Mr. Perez this is an excellent piece of work. Isn't it amazing what you can do with your own equipment at home with care and patience? Without the uber expensive, super whizbang, taxpayer paid for toys only a few can use, you have made as good a shot as the pros. Very nice! Mr. Mays, thanks very much. Yeah, I finally had to give up on the dream of taxpayers funding my observing equipment :) I really do enjoy making the most out of a modest scope and some simple sketching tools. I live on the east shore of Lake Huron in Ontario Canada. If I look South West over the lake I see a very bright light in the sky. Brighter than I have ever seen in a night sky. Is this Lulin, or just a planet? The bright point of light you see in the southwest at sunset is Venus. It's really a spectacular sight when it gets this bright. Comet Lulin is currently in the south-southeast before dawn and is just now getting bright enough to be seen with the naked eye from a dark observing site. However, even then, it is very very subtle and you need to know right where to look to be able to pick it out. A pair of binoculars will help you see the comet as a soft ball in Libra, moving further westward every night. Thank you for responding. Obviously I'm not very knowledgeable about astronomy, but you're right, Venus is beautiful. Every August, when my kids were young, we would have "crazy Mom night" when I would take them to the soccer field south of town, with a picnic, and watch the meteor showers. They loved it, of course. You don't have to be a scholar to appreciate the universe! My son has a telescope, we will look for Lulin. Thanks again! Hello Mr. Perez, normally I'm not anymore watching the night sky with my 4" telescope but concentrate more on the sun. But your report on Lulin made me curious and I took a field glas 7X50 to search for the comet. I found it, this was on Febr.28, 2300 hours in the Philippines. It would really interest me how you make your drawings. They are professional. Is this accomplished with air brush. Really fascinating, your work. Please let me know if there are any questions I could answer. This page contains a single entry by Jeremy Perez published on January 9, 2009 12:37 PM. Huge Site Update was the previous entry in this blog. C/2007 N3 (Lulin) Observation Analysis is the next entry in this blog.